We’ve had some great conversations with customers lately and they’ve given us some insight into why they decided that adding a telemedicine solution was the right move for their practice. They also let us in on some of the fears that they themselves of or other people involved in the decision had to overcome before reaching the decision to give video visits a try. Here are a few of the most common, along with how they can be put to rest. Patients and staff aren’t technically savvy enough to use the technology. This is a reasonable concern for any technology, especially one that will be used by consumers. The good news is that modern software design has made it possible for even sophisticated applications to be easily used by people with minimal technical skills. Of course, you want to carefully evaluate the solutions you consider to verify their “user friendly” claims. But with the right solution, if your patients can figure out Facebook or Facetime, they can easily join a video visit. While it may seem like a leap to get people to change the way they interact with their provider for some visits, the data shows that people are actually ready and willing to embrace the practice. In fact about 74% of US patients said that they would use telemedicine. The rise of online-only providers is another indication that people want the ability to get healthcare without going into the office. We won’t get reimbursed, or it will be a big hassle. Concerns about reimbursement are justified. There is a hodge podge of state regulations and payer policies to consider. The best way to address this concern is to choose a telemedicine platform with built in eligibility verification. Every time a visit is scheduled the system automatically checks to see if reimbursement is available. The best providers even guarantee that if they verify a patient’s eligibility, you will get paid. The software will cost too much. 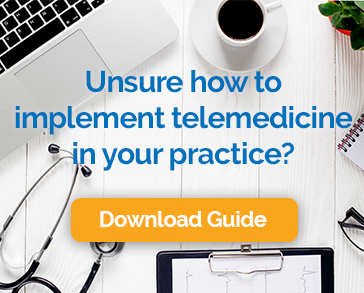 Of course there is an investment associated with introducing telemedicine to your practice, but it likely isn’t as much as you think. There is also enormous potential for a significant return on the investment. We’ve got a handy ROI calculator so you can see how much your practice might stand to gain. It will overburden the providers. This is a common worry, but a well-executed telemedicine program actually improves the work/life balance of providers. Keep in mind that video visits take less time than in person ones, they can be done from anywhere, and they can be done at any time. Some providers find they can work from home for a day, or half day each week, still be productive, and skip the commute. Others do video visits after hours or on the weekends, freeing up time during office hours. It is sensible to be cautious when making such an important change for your practice, but the way people interact is profoundly changing and the market is moving in the direction of telemedicine. These concerns needn’t cause your practice to get left behind.